Dr Harriot Beazley is a human geographer and community development practitioner with a passion for rights-based research with children and young people. 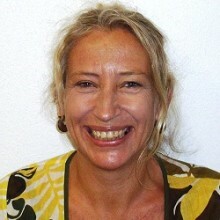 She is Program Coordinator (International Development) and Senior Lecturer (Human Geography) at the University of the Sunshine Coast, Australia. Harriot’s research interests are directed towards child-focussed participatory research in Southeast Asia, especially Indonesia. Her PhD (ANU) research was ethnographic research on the geographies and identities of street children in Indonesia. Since then she has consulted as a technical advisor to AusAID, UNICEF, DEFRA (UK), Save the Children and DFAT on a variety of child protection, social inclusion and gender issues. Harriot has conducted research and published widely on street children in Indonesia and Cambodia, the physical and emotional punishment of children in Indonesia, Vietnam and Cambodia, the commercial sexual exploitation of children in Indonesia, children’s experiences in orphanages after the tsunami in Aceh, children in prison in Indonesia, and the impact of transnational migration on children in Lombok, Indonesia. Harriot is a member of the Research Forum of the International Consortium for Street Children, and is Commissioning Editor for the Journal Children's Geographies.